For most Pittsburghers, some things are as sure as the sun rising each morning. You root for the Steelers. You don’t, unless you absolutely have to, cross rivers. And you buy your seafood at Wholey’s in the Strip District. To push through the store’s swinging red doors is to encounter so many varieties of fresh seafood that if you surrendered your eyes to your nose, you just might think you’re standing dockside near the ocean instead of inside a century-old warehouse. The company is celebrating its 100th anniversary this year and plans on thanking customers by handing out free hats, holding raffles and offering retro pricing on certain products. The family also is collecting stories and photos for a “100 years contest” (monthly winners get a $25 gift card) and in August it will begin a 100-day countdown to a giant party that will be thrown sometime in September. Everyone is invited. A hit with shoppers from the get-go, Wholey’s does fish bigger than anyone else in the city, selling 40,000 pounds of it fresh each week in addition to tons of frozen, canned, smoked and prepared seafood. It’s especially crazy during the six-week Lenten season, which kicked off yesterday and runs through April 7, when sales typically increase by almost 40 percent, says president Jim Wholey, one of four third-generation brothers now running the business. Got a hankering for one of the crispy, deep-fried cod sandwiches the store cranks out on meatless Fridays (and every other day of the week, all year long)? You better get there early, because the line starts forming not long after breakfast. Folks line up, too, for with the tuna and other rolls at Andy’s sushi bar inside the front door. For home cooks, there’s everything from frozen whole octopus and canned scungilli (a large marine snail) to clean-it-yourself bronzini, and wild-caught mussels, oysters and little neck clams to fresh salmon — six varieties on any given day. Not too shabby for a city that’s landlocked. A display of prickly green sea urchins is a great example of the store’s reach: they are flown in live, and still wiggling, from Patagonia. Maybe because it grew organically, the store — which in 1976 became a full-service market, with many of its items locally sourced — is like a food-related theme world, a maze that ensures you see a little bit of everything. On Saturdays, the crush of shoppers pushing through the front door often backs up under the awning, and standing in front of the fish counter can be chaotic. Tickets in hand, folks try to edge past each other to get a view of the offerings. Kids tend to make a beeline to the tall fish tanks at the rear of the store that are teeming with thousands of pounds of live trout, bluegill, largemouth bass and lobster, gill-to-gill against the glass. Drawn by the clink of knives and buzz of an electric scaler, most everyone pauses in front of the fish cutters’ station, where veteran “seafood butcher” Mike Hartman, hired in 1980, and his crew cheerily scale, gut and filet the week’s catch while yakking with customers. On a busy Saturday, they might go through as many as 600 fish; today’s bounty includes a 190-pound swordfish which Mr. Hartman is carving into thick, pink steaks. And that’s just the fish room. Cut left through a narrow passageway, and you’re suddenly in the meat department — beef, pork, sausage, lamb. Everyone is in a rush here, too, Another left, and you’re funneling past a table stacked tall with ice and chicken and into the deli department. Chickens roasting on spits give off a strong aroma and a clerk’s offering a taste of seafood bisque. Next comes cheese and fresh produce and then finally, the registers. Don’t forget to drop some coins into the enormous bronze piggybank at the door before stepping out into the sunshine on Penn Avenue. Fish hasn’t always been the catch of the day at Wholey’s. When Robert Leo Wholey traded his horse-drawn peddler’s wagon for a small storefront on Chartiers Avenue in McKees Rocks in 1912, seafood had yet to catch most home cooks’ imaginations. His McKees Rocks Butter and Egg fed a different sensibility, live poultry and dairy products, along with sausages, meat and coffee. Even after his son Robert “Bob” C. Wholey took the reins after his return from World War II, and in 1951 moved the business to a stand inside the former Diamond Market House, Downtown, the focus remained on poultry. When the city decided to demolish the market house to make way for the new Market Square, Mr. Wholey braved relocating in the Strip, which in 1959 was a still a sleepy network of wholesalers. Not that he was worried his burgeoning poultry biz might flounder: if anything, moving it to the squat brick building at the corner of 17th Street and Penn Avenue would allow him expand and he did — eight times over the next 50 years. “He was very, very intuitive about business,” says his wife, Lois, who for many years was in charge of public relations and at a vibrant 88, still writes ditties for the newsletter. Besides, the Strip wasn’t exactly foreign territory. While studying at Duquesne University, her husband made regular 4 a.m. runs there to buy fruits and vegetables for the food stands he ran in Crafton and Brentwood to pay for tuition. He did, the crustaceans ended up selling like hot cakes, and “then of course people realized fish was healthy and easy to cook as well as delicious.” Soon the bespectacled Mr. Wholey was importing a variety of fresh and frozen seafood. And the rest, as they say, is Pittsburgh history. His family grew along with his business, eventually welcoming nine children, all of whom who worked in the store while they were growing up. 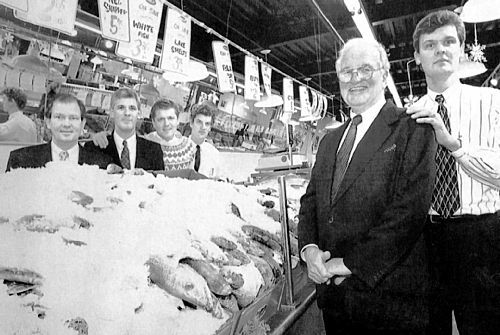 Four of his five sons were hooked for life, following their dad — who always made it home for dinner, no matter how busy — into the family business. A fourth generation, which includes 27 grandchildren, waits in the wings. “When I was in college, I thought, ‘No way,'” says Jim Wholey, who started working there full-time in 1975, after a short stint as a concert promoter. “But then I put one foot in front of the other and surrendered.” Now, he can’t imagine doing anything else, and most days he’s on the floor for at least part of the day, talking with customers, joking with the staff, sometimes handing out samples. Like the city he calls home, Wholey’s is “all about family and relationships,” he says. Until the late 1950s, Wholey's was located in the Diamond Market in what is now Market Square. 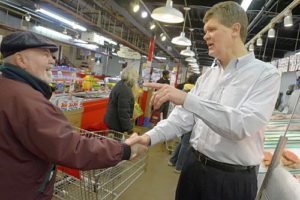 You don’t build Pittsburgh’s largest fish market without a great deal of entrepreneurial skill, long hours and dedication to customer service. But Robert C. also was the ultimate showman, a people person who understood that it wasn’t enough to simply get shoppers in the door, you also had to maximize the experience with lots of activity. One way he set the pace for fun was with a steady stream of promotions. One of the most famous capitalized on the shark mania following the 1975 movie “Jaws.” Figuring landlubbing Pittsburgh would be thrilled to come face-to-face with one of those killers, he put out a call for the world’s largest shark. A fisherman in South Africa took the bait, and in 1977 a 2,400-pound Great White (dead, and packed on ice) was on its way to the Strip. The only problem was, the longshoremen who unloaded the giant fish off the boat in New York couldn’t resist helping themselves to souvenirs. So when it arrived in Pittsburgh, it was absent its teeth. Needless to say, a gummy shark ain’t scary. “So Dad hired a team of dentists to make an exact replica of the teeth,” with insurance footing the $10,000 bill, says Jim Wholey. An immediate crowd pleaser, the shark stayed on display in a glass-front trailer for years, with the $1 each person paid to see it going to charity. Over the years, shoppers also have oohed and aahed over Andy the World’s Largest Pig and Bubba the 100-year-old lobster, traipsed through a petting zoo in the parking lot, been serenaded with accordions, charmed by animated cows and penguins and plied with endless free samples, says Lois Wholey. And don’t forget about the 28-foot-long Fishmobile that made its debut in 1995, or the O-gauge train that circles the fish room above customers’ heads. It runs 12 hours a day, seven days a week, to the delight of children and grown-ups alike. He was right, and today the miniature locomotive is so popular that the store has to keep four spare engines. Many of the “surprises in every aisle” sprang from trips to Stew Leonard’s chain of Connecticut grocery stores, or the family’s travels. But not all. Bill, the white-coated black bear that greets shoppers at the front door, was oldest son Bob III’s idea. So was Rachel, the giant solid bronze pig by the exit that’s a clone of the porker at the opening of the famed Pike Place Market in Seattle. Coins slipped between her shoulder blades have raised thousands for The Children’s Institute in Squirrel Hill since 1994. Stunts aside, the main focus throughout the years has always been making shoppers happy. People gravitate to someone they trust, Lois Wholey says, and so each generation has worked to embody the motto carved in stone outside the front door: Rule No. 1. The customer is always right. Rule No. 2. If the customer is ever wrong, re-read Rule No. 1. Maybe that’s why there is no typical Wholey’s shopper, but instead a clientele that includes all ages, colors, races and backgrounds — from hipsters with lip piercings and grandmas in sensible shoes to dads with young sons and regular customers who shopped there as children with their parents, such as Ed Lancia of Beechview, who on a recent Tuesday was in search of lobster tail, shrimp and fresh flounder. “My mom and dad used to drag me along,” he says with a smile, “And now I come at least once a month,” usually with his wife, Andrea. No one’s sure which of Robert Wholey’s grandkids, nine of whom are in college, will step in to guide the store into the next century. But already, the brothers are working with the University of Pittsburgh’s Katz Graduate School of Business to develop a plan. Which is a good thing not just for Saturday destination shoppers but also city residents who shop there every day. “People don’t realize they service a lot of Downtown neighbors, from the Hill to Lawrenceville to Oakland,” notes Ms. Rodgers. “With fish,” says Lois Wholey, “the simpler the recipe, the better.” And if you can work in a few veggies, all the better. Spray a baking dish with vegetable oil spray. Combine all ingredients except fillets in a bowl, reserving some of the melted butter. Lay fillets in baking dish and divide stuffing on top. Roll fillets up and arrange seam-side down in pan. Drizzle with remaining butter. Bake 12 to 15 minutes or until fish can be flaked with a fork. Garnish with lemon slices. Sprinkle fish lightly with salt and pepper. Dip fillets in beaten egg white, then pat both sides in almonds. Lay fillets in a pan or cookie sheet sprayed with vegetable oil. Drizzle with melted butter. Bake 12 to 15 minutes or until fish can be flaked with a fork. Garnish with avocado cubes and lemon slices.